70 to 80 Degree Temperatures and $300 Round Money are just what the racers ordered! 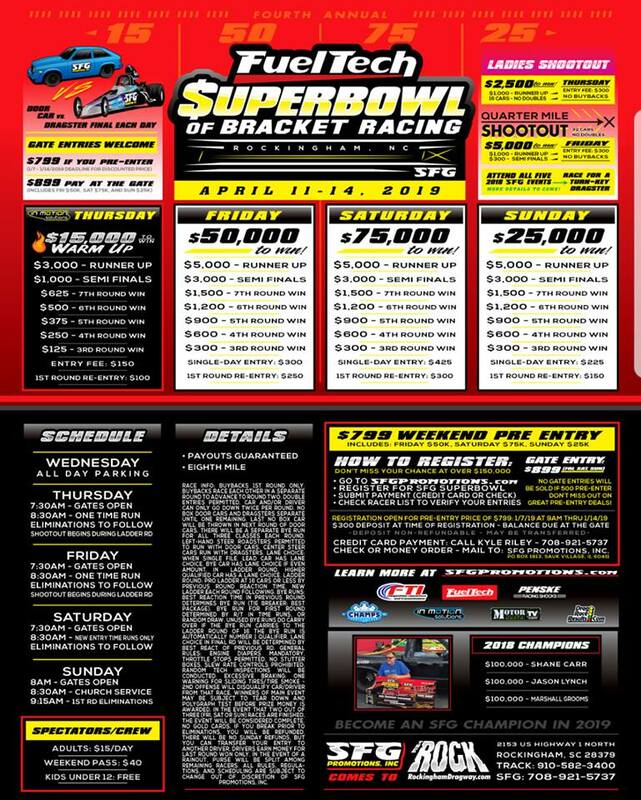 Next week's SFG Promotions FuelTech SuperBowl of Bracket Racing will bring both to Rockingham Dragway in North Carolina. A $15,000 to Win Warm-Up will be run on Thursday for only $150 prior to the Weekend's $50k-$75k-$25k Main Events. Gate Entries are welcome for only $899 for the weekend's 3 main races. All Day parking on Wednesday. Live Coverage will be shown all weekend long on DragRaceResults.com from Motormania TV.